I am a volunteer bird monitor for the forest preserve, and in June and July I count breeding birds at several monitor points. Monitoring needs to be done between 6am and 9am because that is when the birds are most active. I’m not thrilled with getting up that early, but on the positive side, the prairie is beautiful in the morning light, and it’s peaceful and quiet. Unfortunately there are also a lot of mosquitoes and bugs, but bug spray keeps most of them away. The clover was blooming and looked like a carpet of purple. 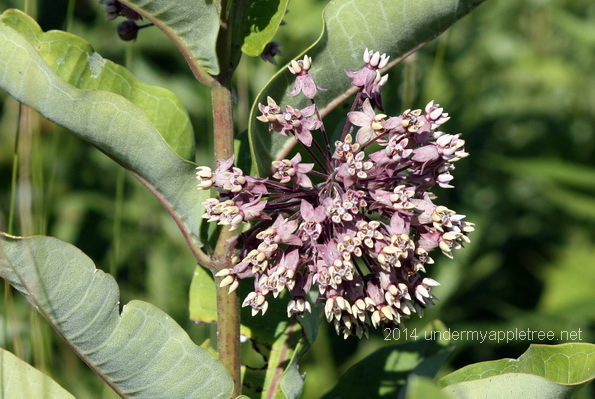 I was happy to see some Milkweed plants along the path. It is the only plant on which the Monarch Butterfly will lay eggs, and on which the young caterpillars will feed. The Monarch population has been shrinking due to a loss of habitat in agricultural areas of the US. 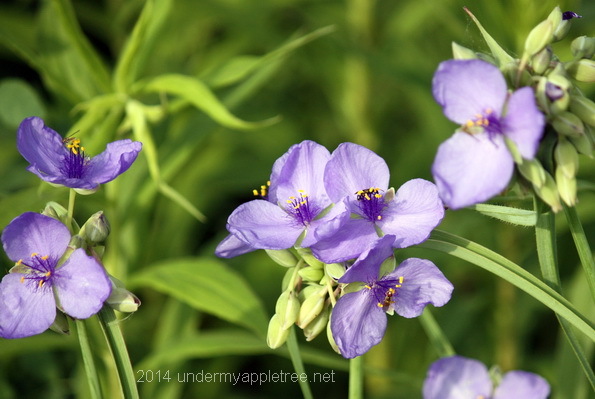 The Spiderworts were beautiful. 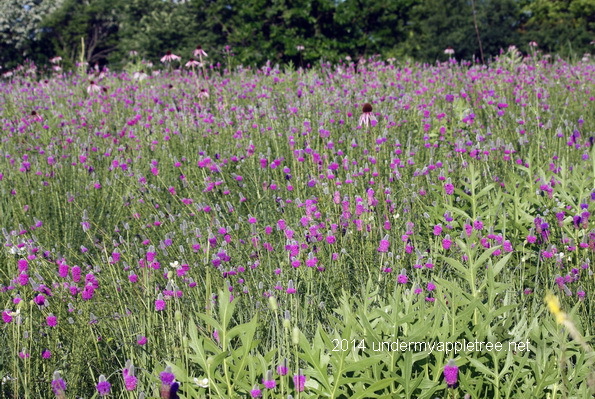 Purples and pinks are popular colors on the prairie in June. 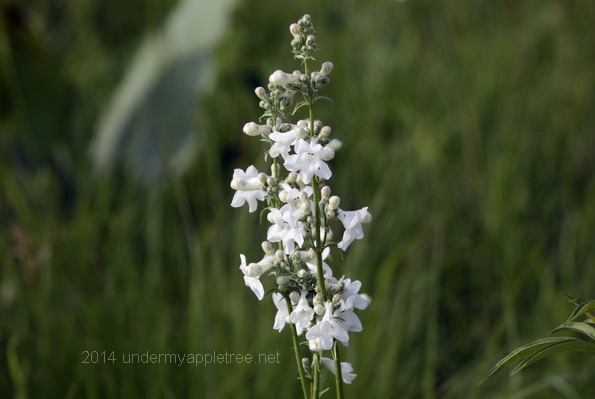 I’m not sure what this is, maybe Prairie Larkspur? Anyone know? I have to walk through a 5-foot tall section of prairie grass and plants to get to one of my monitor points. The path must be very close to a Red-winged Blackbird’s nest. How did I know this? The male was sitting on a shrub along the path and didn’t move as I approached. As I passed him, he swooped at me, nearly hitting me in the head, screeching all the while. And then he followed me until I was out of range. 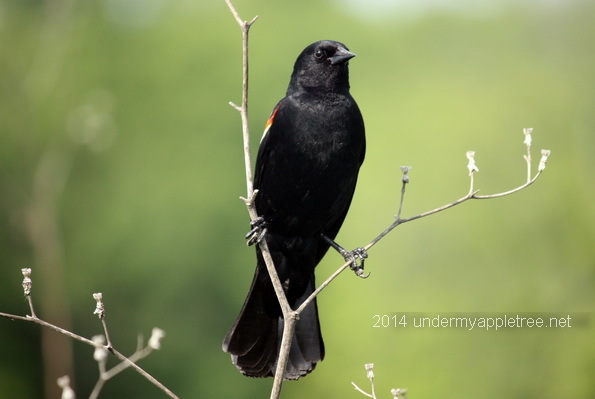 Male Red-winged Blackbirds can be very aggressive and may have multiple nests in their territory. I’ve had them dive at me before but this is the first bird that literally chased me until I left his territory. I’m thinking a helmet instead of a hat might be a good idea on my next visit! Such beauty was worth getting up early to see, wasn’t it? I didn’t realize red-winged blackbirds were so aggressive. This little guy looks like he’s guarding his post and won’t put up with any nonsense! I didn’t even try to take a photo of the aggressor! I believe he would have hit me if I stayed there. This is a different bird further along the path. He just gave me the evil eye as I passed and let me take a photo without incident. Lovely photos. Red-winged blackbirds are my favorites. Oh, how I love their songs. Bird diving! I like that. I’ve had Barn Swallows dive at me too. That sounds like a wonderful time – even if it is early! The meadow must be so serene. Great photos! Lovely photos of such pretty flowers. I didn’t know that red winged blackbirds were so territorial and aggressive- our magpies do that. What fabulous shots! I especially love the meadows….thanks for sharing! Love the photos! I miss the midwest. What lovely photos! I have never seen Milkweed in that color. 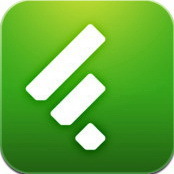 I will be taking a blogging break but will return soon. 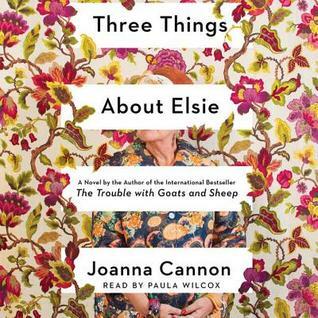 Enjoy your reading, Leslie! The flowers are lovely and the bird well awesome as well. That is an amazing display of purple prairie clover. It must really be loving all the rain this summer. I think that might be prairie larkspur, although your plant has many more flowers on it than the ones I’ve seen, but they are flowering right now also.